Can you think of the last time you used a product, played with an app, or visited a website and had a frustrating experience? Maybe it was so bad that you literally threw the product away or returned it, deleted the app, or left the website? The implication of bad design often times means lost business, a bad reputation, and ultimately, an unsustainable business. Consumers today, now more than ever, have high standards for quality in everything they interact with. Look at companies like Apple, Netflix, and Lyft. There is a reason why they are winning – they focus on amazing user experience and design. As the world continues to rapidly shift toward adopting technology, brands’ first interaction with consumers is often times on a screen. First impressions make or break a buying decision. A poorly designed site leads prospective customers to believe the product, customer service, and every other aspect of the business is poor quality. McKinsey tracked the design practices of 300 publicly listed companies over a five-year period, in multiple countries and industries. They interviewed and surveyed the senior business and design leaders at these companies, and collected over 2 million financial data points, and over 100,000 design actions. The companies who earned the highest McKinsey Design Index scores saw increases in revenue and shareholder returns at nearly double the rate of their industry counterparts. Ultimately, the data collected lead to four main areas of focus a business needs to prioritize in order to set itself apart from competition, and increase revenue and shareholder returns. What a lot of people do not realize about design, is that it is way more than art and making things pretty. Setting up your digital products and websites to track engagement data is a fantastic way to start learning what works and what doesn’t, from your prospects and customers. Using the insights you gather to make informed design decisions is the best way to put your users first, to ensure they keep coming back. 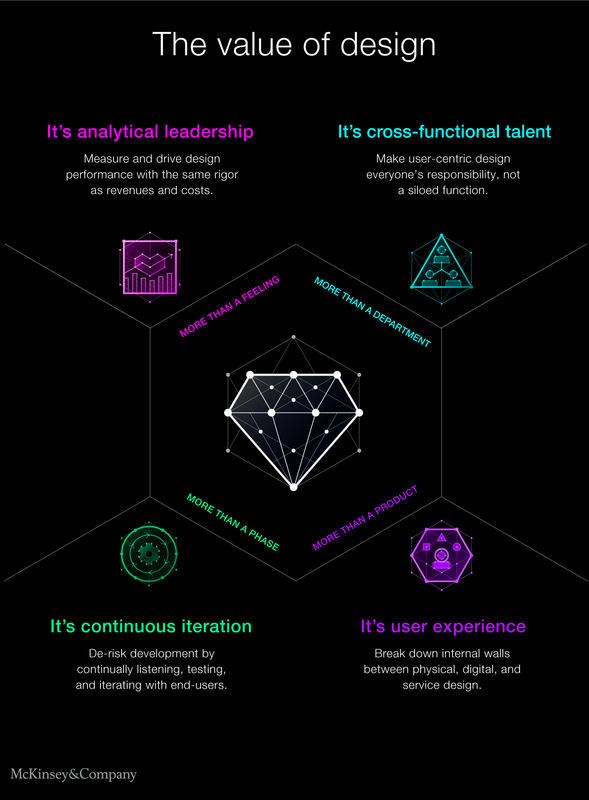 Marketing, sales, customer service, data scientists and other departments can all provide valuable insight into what customers want, allowing a business to improve the user experience. An important caveat to the previous two themes is that it is a continuous journey. You cannot improve something once, and expect it to be great. The companies who are best at this make minor tweaks, test which performs best, and implement the winner; then they repeat this process over and over again. Good design is good user experience. Is your website intuitive? Can a customer land on your site and accomplish the task for which they visited your site quickly? Is your physical store clean, well lit, and inviting? Are there friendly employees available to help answer questions? User experience covers digital, physical, and service experiences, and it is often a key factor in determining if a user is going to become a loyal customer or not.